Photos courtesy of Songwriters Hall of Fame inductees Don Schlitz (left) and Desmond Child (right). Part of the mythos of the music industry is the Cinderella story. You know the one: someone comes along and plucks an artist from obscurity, whisking them away to the life they dream of. Hey, it happened to Justin Bieber — from YouTube crooner to multi-platinum artist almost overnight — so why not you? That’s what the Songwriters Hall of Fame is aiming to accomplish for a deserving Sonicbids artist with this year’s Songwriters Hall of Fame Song Competition. Both amateur and professional songwriters are invited to enter to win an exclusive Universal Music Publishing Group contract, two tickets to the 2015 Songwriters Hall of Fame Annual Induction and Awards Gala, and recognition from the stage in front of the industry’s most powerful star makers from music publishing, record companies, producers, managers and songwriters representatives. In addition, four second place winners will receive a one-hour creative and career mentoring session with a legendary songwriter who has been inducted into the Songwriters Hall of Fame, among other spoils. 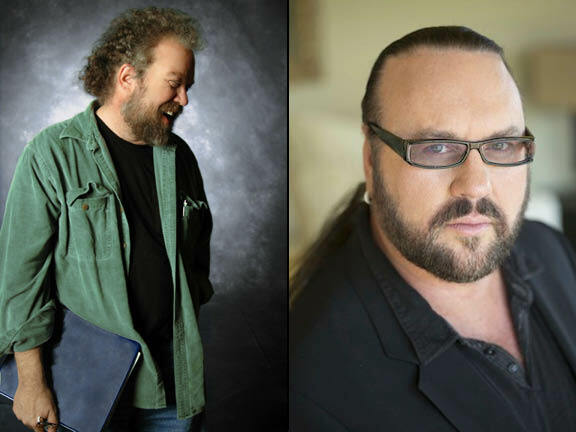 Desmond Child and Don Schlitz are two of the songwriting luminaries who’ve volunteered to lend their time and talents to the competition. Child, a veteran of the industry with nearly three decades of experience, has worked with big names like Kelly Clarkson and Bon Jovi. Schlitz, a master of country tunes, penned hits like Kenny Rogers’s “The Gambler” and Mary Chapin Carpenter’s “He Thinks He’ll Keep Her.” Both men have Grammys to their names. Sonicbids recently caught up with these songwriting veterans to talk about their careers, the competition and their advice for aspiring songwriters. Schlitz: I’m not a celebrity songwriter. I’m a songwriter. I live in the parentheses. I love being able to work on something different every day. And I love being “behind the scenes.” You can get more work done out of the spotlight. Who helped you along the way to the top? Child: I was helped by many caring, inspiring, wonderful people, including Eliot Hubbard, who hired my band Desmond Child & Rouge to play at his night club, Reno Sweeney, in NYC in 1976, which gave us the exposure that led to a record deal at Capitol Records. I was also helped by Barbara Skydell, who was president of Premier Talent Agency. Winston Simone, my manager for 28 years. I had amazing mentors like Mrs. Marie-Louise Leeds, my first voice teacher in Miami Beach, where I’m from, who believed in a poor Cuban refugee boy and taught me [for] free; acting teacher Sandra Seacat, who let me be a fly on the wall in her classes with huge stage and movie stars and taught me how to get the most out of an artist; legendary songwriter/producer Bob Crewe (Four Seasons), who took me under his wing for two incredibly fun years and taught me everything I know about songwriting. Schlitz: I arrived in a much less-crowded Nashville in 1973. I was 20 years old. I got a job at Vanderbilt as a computer operator and made friends with other young arrivals who also were writing songs. We played the sparsely attended Writers Nights, listened to and encouraged each other. I was lucky to meet some established songwriters who worked at publishing companies: Buzz Rabin, Bob McDill, Jim Rushing, Paul Craft. They patiently listened and smiled and urged me to keep writing. Bob McDill was the one I spent the most time with, and by example, he showed me how important it is to stay in the process, to keep writing, not to just wait for inspiration. He told me I’d get 10 songs a year from inspiration, and my job was to write 40 more that could be played on the radio. He taught me to respect commercial music – that a commercial song meant that people liked it. Merlin Littlefield signed me to ASCAP. He believed in and pitched my song, “The Gambler,” to Larry Butler, who recorded it with Kenny Rogers. It was my first recorded song, and Kenny was about the seventh singer to record it. Merlin kept pushing me and “that song,” and it only took two years for “that song” to become a hit! Chuck Flood signed me to Capitol Records and later became my manager and publishing partner. He and I still work together, and he never ceases to challenge me to stay “in the process” without worrying about the end result. What are some of the valuable bits of advice your own mentors in songwriting gave you? Let’s say you had entered a contest like this early in your career and won. How do you think it would have changed the trajectory of your life? Child: If I had been able to enter a contest like this when I started out and won, it would have saved me years of struggling to get heard by the right people. Hey, can I enter the contest? Oh, I forgot I’m one of the prizes. Shucks! Schlitz: In a way, every song that gets pitched to an A&R person, producer, manager and recording artist is part of a contest. It’s their job to find the song that best fits their needs. It doesn’t mean the other songs are bad, it just means they’re not “the one” this time around. So I suppose I really did enter a lot of contests early in my career… and lost. I would hope that the participants in this competition would also find something to make them a better songwriter, even if they don’t win. For me, if I had won too early, I don’t think it would have served me well. Looking at my trajectory, I believe the most important thing I ever did was finding my process, not being concerned with the end result, and refusing to quit. What advice do you have for contestants, in terms of how to select their strongest material for this competition? Child: Play all your songs for all of your friends and family and get a consensus of which ones they like better. Then get them to pay for you to submit them all. You never know… the worst one might be the one the judges like best. It’s like the lottery; if you don’t play, you don’t win. Schlitz: Don’t be afraid to go against the prevailing winds. Last week’s hits are not next week’s hit. They’ve already had their day. Find your voice. Realize that you are unique, that you turn and twist your head and look at the world in a way that no one else ever did or ever will. And unique is what “they” are looking for. Oh, and “they” don’t know what it is yet, either. But we all know it when we hear it. Just send your best song. Lick the proverbial stamp and let it go. Then take a breath and celebrate realizing that you have no idea what your best song is. Then write another. Child: Anyone can write a song. Crickets, frogs and birds do it all day and night long. They are calling out to each other, answering their heart songs. Songs are sung stories and when you tell a really sad story, singing sounds like crying. And when other people cry, it makes you want to cry too. I don’t know why. Ask the birds. Schlitz: I don’t believe that opportunity only knocks once. I think it knocks and asks, “Are you ready?” If the answer is not yet, then opportunity says, “Okay, take your time, get ready – I’ll be back soon enough.” Then one day, you’ll hear the knock and the question again. There’s no telling how many times it will happen. So stay in the process, don’t pretend to know the end result, give it your best shot, and write another and another. And remember to enjoy it all, even the parts that no one in their right mind would: the loneliness, the out-loud expression of real emotions, the re-writes, the rejection, even the realization that after you have a hit, you have to start all over. If you can’t find a way to enjoy it all, then find something else to do. Because, full-circle here, I don’t really believe that there’s such a thing as a “celebrity songwriter.” No amount of fame, or money for that matter, can make you love it if you don’t. But if you do love it, if you’re not afraid to try, if you’re not afraid to be unique, if you’re not afraid to be a songwriter, then someday, when you don’t expect it, you just might be walking down the street and hear someone singing your song. And there’s no way to say in words what kind of feeling that is.